The Women in Energy Challenge, part of the Off-Grid Energy Challenge, was launched in 2016 by USADF and GE to identify and accelerate enterprises either led by women or benefitting women and help African entrepreneurs compete in the global economy. The Off-Grid Energy Challenge is a part of Power Africa’s Beyond the Grid initiative, which aims to drive private investment in off-grid and small-scale renewable energy solutions. By funding energy entrepreneurs, USADF is bridging the energy gap for some of Uganda’s most vulnerable populations. Joint Energy and Environments Projects (JEEP), a 100% women-owned enterprise in central Uganda. 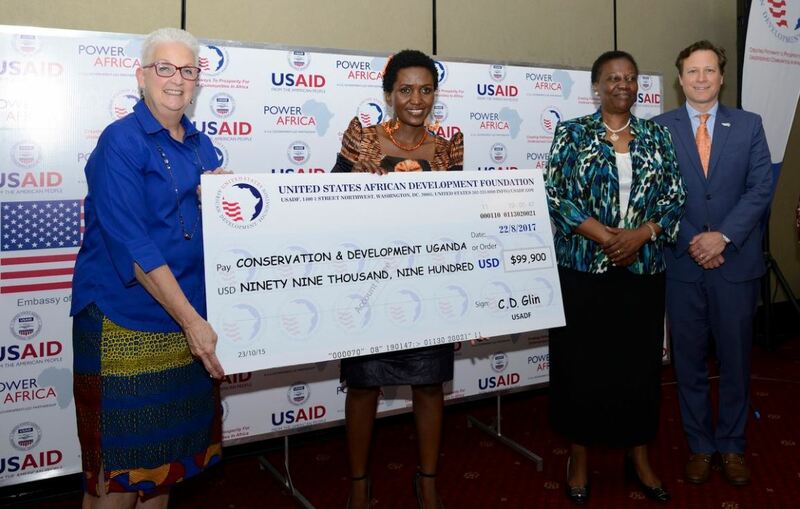 With a $100,000 grant, it will install 6 green power units in Kalangala district, a remote island district in Lake Victoria. Fishing is the main industry in this island district in Lake Victoria, but commercial ice to preserve fish is both expensive and limited. As a result, a significant amount of fish is lost before it can be sold in the market. The 6 green power units which JEEP establishes will each have solar-powered cold storage facilities for preservation, phone charging and solar home systems for sale, and each will be run by a women’s group trained in bookkeeping. The green power units will each repay a portion of their profits to JEEP to be used to replicate the model throughout the region. This will not only provide local jobs but will increase incomes for local women. Conservation and Development Uganda Limited (CODE) is a majority-women owned enterprise in western Uganda where surrounding national parks limit the amount of available firewood, and as a result, women bear the brunt of energy poverty, walking long distances in search of firewood and cooking fuel. Through the grant, CODE will sell an initial 350 Agro-Eco kits using a flexible repayment financing model, which will provide alternative and safer fuel sources. Using a low-cost distribution system using Village Savings and Loan Associations, CODE will collect revenues and expand their business to impact more and more households in the region.